File Query Cookbook | Serving tasty file reports one query at a time! Each day we go about our business whether we create software, train a child in a school district, build planes in aerospace, provide healthcare, insure peoples stuff, etc. We all have data with varying degrees of importance, some highly critical to the business directly and some highly critical to our customers, while other data is the communication that helps our business units successfully work together. Each of the data types have similarities in size, age, ownership, and a level of security. What types of data are we maintaining? Who has permission to access the data? How fast are we using up our storage space? How often is the data being accessed? Once queried the data needs to be collated into reports. These reports are read differently based on the perspective of the individual. A volume free space report, read by the Director of Information Technology will not be read with the same perspective as the Business Manager, as the former is figuring out the storage budget, while the other is wondering where the all the current data is. Reports may need to be laid out differently in order to drive the business intelligence needed, based on perspective. This site attempts to help you learn how to write queries and generate report layouts to help you achieve a new level of success, while supporting, maintaining, and protecting your storage. Download the zip file containg the SQL query and/or Report Layout (repx) file. Extract the zip contents to a local folder. 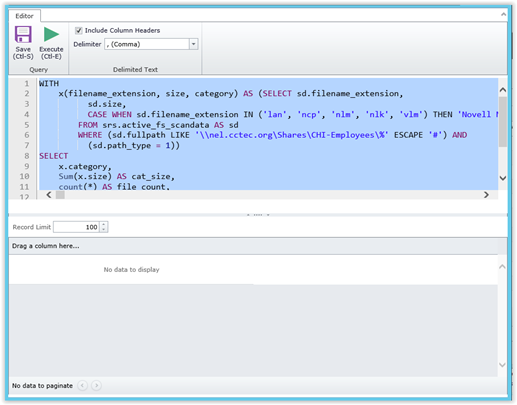 The SQL file can be opened with a text editor, and its contents copied and pasted to the either the Custom Query SQL editor using either the Web interface (figure 1) or in the Report Designer (figure 2) for a given Custom Query report definition. This is file extension report that displays the fullpath, filename, size, owner, scan_target, and file_extension from the srs.current_fs_scandata_eir database view, and is limited to current scan data in eDirectory.